The top heavy, tapered sides hairstyles have everyone itching to big chop but hesitant to sacrifice the length. 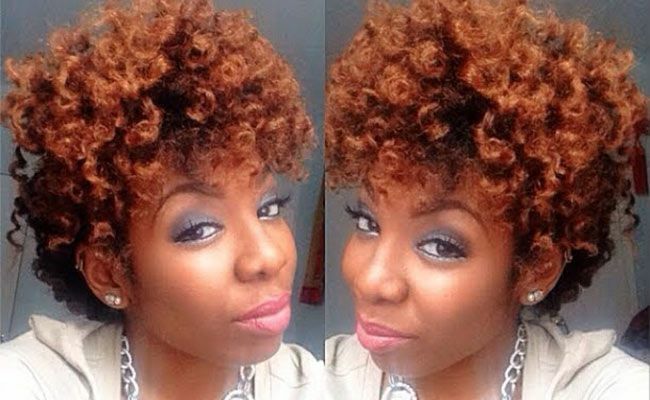 YT vlogger Naturally Nellzy created a faux tapered frohawk that is perfect for medium length coilies and transitioners. For best results and bigger volume, try this style on stretched hair. Divide the hair horizontally into front and back sections and secure with hair clips. Starting with the back section, apply the Entwine Couture Afrodisia 9 Exotique Leave-In Hair Potion to your hair starting from the ends to roots. Create a one-inch section in the back and apply the Entwine Couture The Manipulator Crème Jelle Styler. This product will help to set the style. Seal the moisture in by applying the Entwine Couture Total Perfection Raw Vegan Argan Oil from ends to roots. Begin two-strand twisting the one-inch section. Once you are to the end, begin to wind the twist to the scalp like a bantu knot. Continue steps three to five for the entire back section. Once the back section is complete, divide the front into vertical cornrows from the crown to the ends. Apply the Entwine Couture Crème The Manipulator Jelle Styler and seal with the Entwine Couture Total Perfection Argan Oil from ends to roots. Start flat twisting from the crown to the edges and continue twisting to the ends. Roll the ends with a perm rod roller. This will assure that the ends have definition once the style is released. Once the front is complete, secure the set style with a satin scarf and allow it to set overnight. Gently release the bantu knots and flat twists in the morning. Pull the side sections toward the crown region and secure with bobby pins in order to create the allusion of tapered sides. Pick your roots in the front section for added volume and your look is complete! You can find Naturally Nellzy on YouTube and Instagram.